Laura is a Morgan sculpt, by Aleina Peterson. Laura was painted with Genesis Heat Set Paints, and has a Sweetheart Rose complexion. The painting was sealed with matt varnish, to proctect it from fading away and being damaged. Laura's hair was rooted with a 43g needle, and is very soft to the touch. I used warm blonde Susan Nagel's mohair. Her hair was glued inside the head, so it won't fall out and you can style it your way. 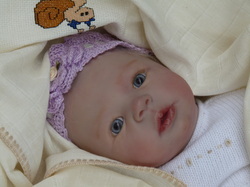 She has a german disc jointed cloth body, which allows her to be posed in many different ways. She has gorgeous beautiful victorian blue eyes. Laura was filled with the best quality materials available. This baby was made with care and love. It took me many, hours of manual hard work to complete her. She is not a toy, but a collectible item. If cared properly, she can last for generations to come.